You won't see anything like this ANYWHERE. Please don't fall for cheap imitations. I am the original. 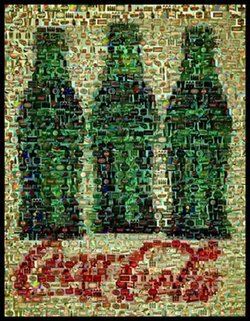 From a distance this looks like a picture of 3 classic Coke Bottles but look closer. Its actually mini-pictures that are 1/4 inch by 1/4 inch with remarkable detail (click on "close up" image). 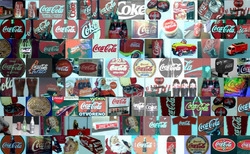 The mini-pictures are of everything Coke including classic items, vintage signs, current containers and more. I have gathered and arranged these very carefully myself. This is for the true collector. The entire item is 8 1/2 inches by 11 inches and perfect for framing. Winning bidder pays $2.50 shipping.